Hot spots at the rear of Manka’s restaurant continued to flare up for hours after the fire had been contained. 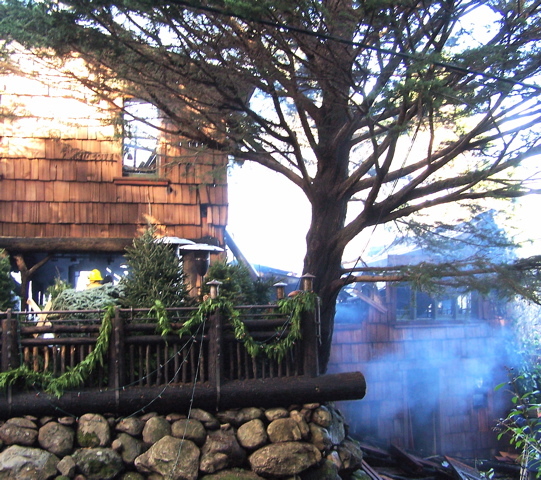 Winds that gusted to hurricane force toppled a tree onto Manka’s Inverness Lodge and Restaurant early Wednesday, breaking a gas line and starting a fire that gutted the 81-year-old wooden building. Trapped. 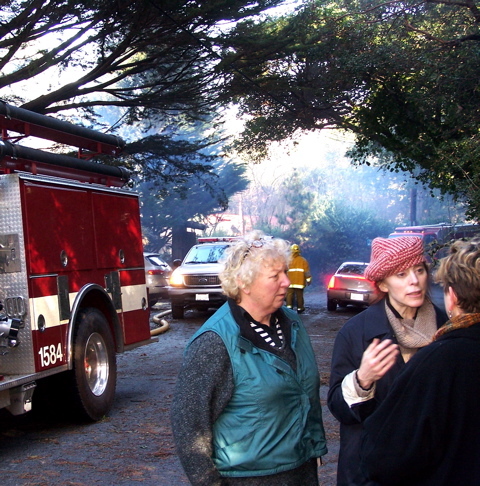 A guest who escaped unharmed with his possessions nonetheless found his car stuck for hours in Manka’s parking lot, hemmed in by Inverness and Marin County firetrucks. The tree fell onto Guest Room 7 and went through it into Room 4 where it hit a hotwater heater and broke the gas line. All of those in the building escaped unharmed, including overnight guest Jake Gyllenhaal, who starred in the movie Brokeback Mountain, and his actress sister Maggie. Inverness and county firefighters were called out at 2:43 a.m., and by the time the first firetrucks arrived, “it was going pretty good,” one Inverness fireman told me, so there was little that could be done except keep the fire from spreading. 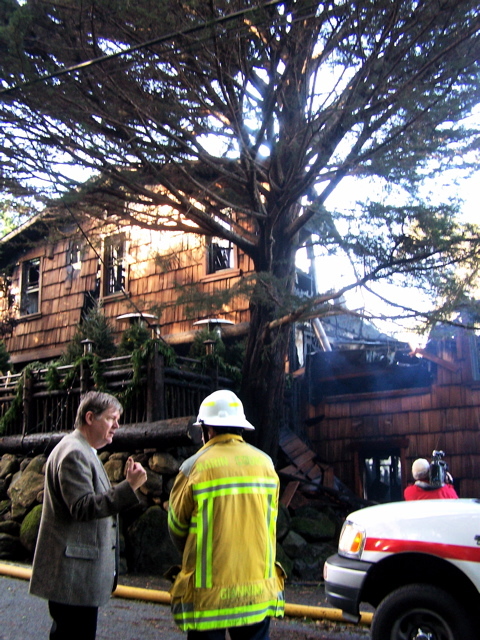 Firefighters did manage to save the original building on the property, a 106-year-old cottage. 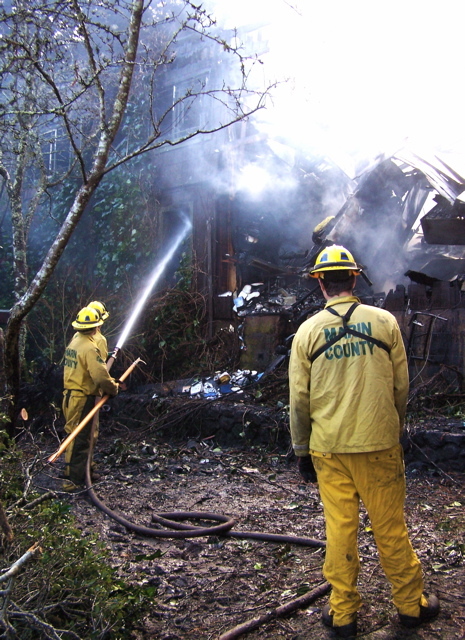 Heavy rain and Arctic wind (which gusted to 100 mph atop Mount Tamalpais, county firefighters were told) not only sent the tree crashing onto Manka’s, it did less-severe damage throughout West Marin. Falling trees blacked out much of West Marin most of the night. 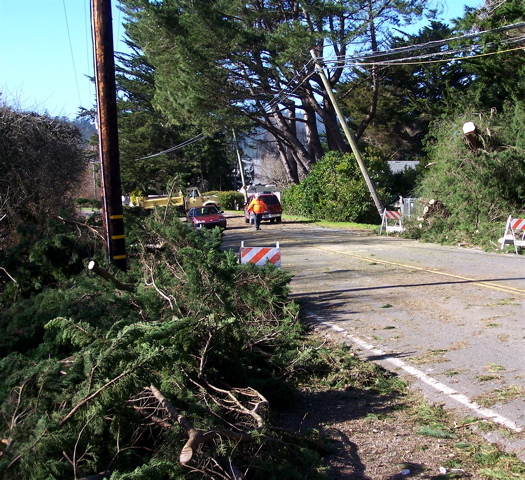 A tree that fell on a utility pole along the levee road in Point Reyes Station forced closure of the road for much of Wednesday. Sections of Highway 1 between Point Reyes Station and Olema were flooded during the night. Manka’s under its former owners, the Prokupeks, was known for decades as a Czech restaurant. Current owner Margaret Grade bought Manka’s in 1992, refurbished the building, and developed a cuisine around wild game, locally grown organic meat and produce, seafood and elegant desserts. In recent years, Food and Wine magazine repeatedly rated Manka’s as among the top 50 hotel restaurants in America while The San Francisco Chronicle called it one of the top 100 restaurants in the nine-county Bay Area. Manka’s owner Margaret Grade (center) herself was one of the chefs, and several of those who worked with her were in tears Wednesday morning. However, when Margaret spotted me taking photos, she might just as easily have been the congenial hostess welcoming guests at the door. Only the front wall of Manka’s restaurant remained mostly standing. Sky can be seen through the windows of a guest room whose roof was consumed. Despite the circumstances, however, Margaret remained the upbeat person I’d always known her to be, and before the fire was out, she had begun talking about rebuilding. Responding in kind, I asked her if she already had a contractor in mind. Great pictures, Dave. Wish it was of a happier event. It’s been windy down here in L.A. too. The TV showed 18-wheelers skittering across the freeways like Tonka toys tossed by a petulant 4 year old. I was going through your blog because I realized that I had not done that in a long time. The article that opened my eyes the most was the Manka’s Lodge one. I had no idea that storms in West Marin can cause so much trouble; thanks for keeping us informed! Something I found VERY interesting was that you mentioned “Jake Gyllenhaal” being there! I am almost sure you are talking about the same guy that star’s in the movie October Sky. I am a pretty big fan of his! I hope we are talking about the same guy. Haha. Keep up the good work Dave; the articles, the pictures, EVERYTHING looks real nice! I can only imagine how many people miss reading these entertaining things at in The Light newspaper! I was very saddened about the incident at Manka’s Lodge. However I was very glad to hear that no one got hurt. I also was not surprised that my friend J.B.Gyllenhaal was there trying to help out. He’s an amazing man. I hope everything gets back to normal soon. Dave. thanks so much for your great blog. It’s SO great to read the news from your blog about our beloved West Marin. I was so saddened by the burning of Manka’s–I’ve been going there since I was a child. I sent many of my guests over there too. What a horrible loss. I’m sure this must be hardest on the owners and all the other people who work there. Querido David: Siento mucho que Manka’s se incendio. Tengo muy buenas memorias de cuando mi hesposo, John Goodman, tocaba musica hay con un trio de jazz. He vivido en San Miguel de Allende, Mexico dos anos y agredesco El Blog para saber que esta pasandon en el Punto de Los Reyes. Tus fotos me tain hermosas memorias de la naturaleza preciosa de El Punto. Saludes a todos. Thanks for the story about Manka’s. I am saddened by the loss of this building and the (hopefully temporary) loss of jobs for the folks that work there. It was that building, the “Inverness Lodge” that my aunt, May Richardson, first bought when she came to Inverness in the forties. She got my father to come here from the east coast to help her with some building projects and…. here I am. Unfortunately I don’t have a clear picture of how long she owned the place, but maybe her son would know. I enjoy the blog on occassion. Thanks. Sparsely Sage and Timely is powered by	WordPress 4.9.10 and delivered to you in 0.406 seconds using 52 queries.